BarTender Software by Seagull Scientific enables organizations around the world to improve safety, security, efficiency, and compliance by helping create and automate the printing and control of labels, barcodes, RFID tags, plastic cards, and much more. Some of the world’s largest companies and hundreds of thousands of small businesses rely on the BarTender software because it has labeling software for every industry and regulation. BarTender Software for Chemical Labeling: BarTender software is already solving the labeling challenges of chemical facilities around the world as it is an integral component of the GHS compliance labeling strategy of these chemical facilities, from ICIS top 10 manufacturers to small, regional operations. BarTender Software for Food Labeling: BarTender barcode and label software is an integral component of the compliance, traceability and supply chain interoperability labeling strategies of food producers, processors, logistics providers and manufacturers around the world. BarTender Software for Labeling and Marking Medical Devices: Built to help meet security demands of UDI, BarTender provides full audit trail capabilities throughout the entire labeling process. BarTender is scalable to any system requirement and is adaptable to the entire spectrum of AIDC technologies. BarTender Software for Pharmaceutical Labeling: BarTender is at the heart of FDA-validated pharmaceutical manufacturing installations around the world. It delivers secure, auditable barcode and RFID labeling, all backed by industry expertise. BarTender Software for Supply Chain: BarTender can help you accelerate your value chain transformation, providing integrated business planning and interoperability while offering ease of deployment and legendary technical support while being backed by industry expertise. BarTender enables compliance with the expanded security requirements of the labeling processes in regulated environments. BarTender Software for EU Food Allergen (FIC) Labeling: The BarTender EU Allergen Label template is completely configurable. Automates emphasis and formatting of allergens in your ingredient list. An editable list of allergens allows easy modifications should the regulation be updated or you need to comply with other, similar, regulations that may be enacted. Many food packaging and repackaging businesses have a need to find a packaging label that has an adhesive suitable for indirect food contact. Most importantly these business need a labeling solution that meets Food and Drug Administration (FDA) guidelines for indirect food contact. Indirect food contact is defined as a substance that may come into interaction with food as part of packaging or processing equipment, but are not intentionally added directly to the food. Using a label that doesn’t meet food contact requirements can potentially lead to contaminated food, product returns and fines for having unapproved adhesives used in a food application. Zebra manufactures several sizes and types of labels that have an adhesive formulation developed to meet FDA regulation 175.105, indirect food contact (see this list for FDA approved labels). These labels are approved to be used for indirect contact food applications such as, label food in a retail location to large scale packaging of food from a manufacturing facility. 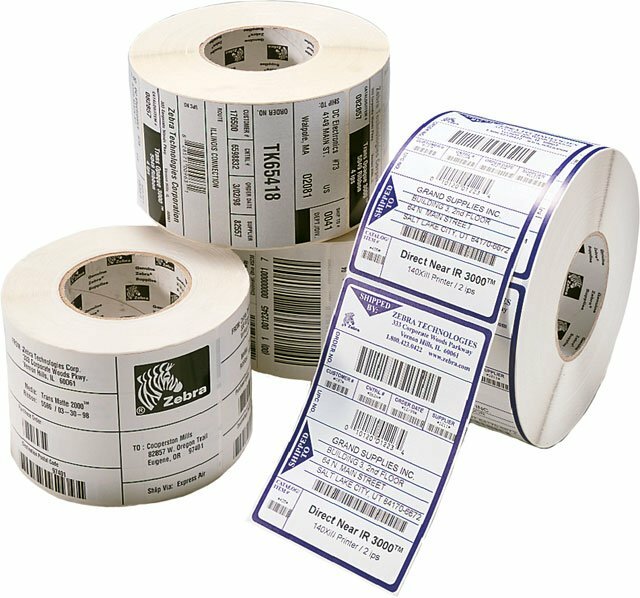 Avoid the hassle and expense of using non-food approved labels by introducing Zebra labels, which meet FDA regulation 175.105 for indirect food contact, into your food application today. Contact your dedicated BarcodesInc representative today, for more information.